Boyar Schultz 612 Deluxe 6” x 12” Surface Grinder. Kalamazoo mdl. H9AW 9” Horizontal Band Saw. Brobo “Super 325” Cold Saw. CTD mdl. M-225 14” Abrasive Cutoff Saw. CompAire Hydrovane 118 Air Compressor. Max 16” Pedestal Disk Sander. Craftsman 15” Pedestal Drill Press. Craftsman 12” Bench Model Drill Press. Miller Syncrowave 250 CC-AC/DC Arc Welding Power Source s/n KG057687. Miller Syncrowave 250 CC-AC/DC Arc Welding Power Source s/n KC184590. Miller Millermatic 250 CV-DC Welding Power Source and Wire Feeder. Hobart RC-200 Arc Welding Power Source s/n 86SW11418 w/Wire Feeder. Acme Type 1-24-15 15kVA x 24” Spot Welder s/n 4126. Devilbiss 5Hp Vertical Air Compressor w/ 60 Gallon Tank. 1998 Accurpress mdl. 7606 60 Ton x 6’ CNC Press Brake s/n 5608 w/Accurpress CNC gauge Systems Controls, Pedestal Controller, 8 1⁄4” Throat. 1995 Accurpress mdl. 7606 60 Ton x 6’ CNC Press Brake s/n 3080 w/Accurpress CNC gauge Systems Controls, Pedestal Controller, 8 1⁄4” Throat. Chicago mdl. 810-L 60-90 Ton x 10’ CNC Press Brake s/n L-18035 w/ DRO CNC Controls, 8” Throat. 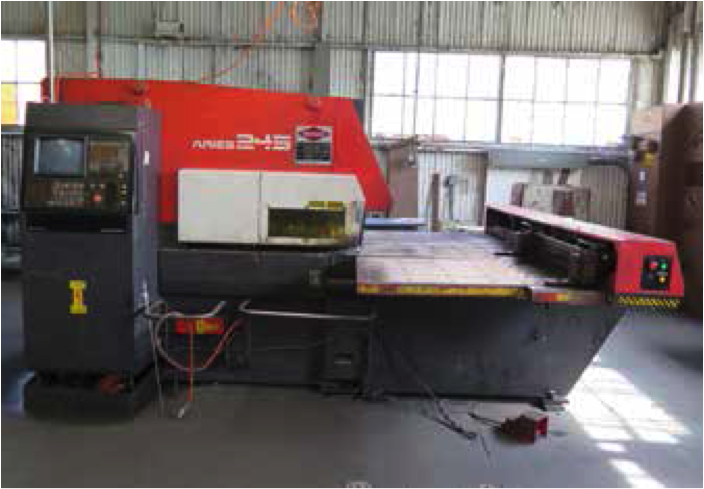 1995 Amada Aries 245 20 Ton CNC Turret Punch Press s/n24501065 w/ Amadan O4PA Controls, 20-Station Turret, 2-Indexing Stations, Ball-Top Table. 1990 Amada Aries 245 20 Ton CNC Turret Punch Press s/n 24500655 w/ Amadan O4PA Controls, 20-Station Turret, 2-Indexing Stations, Ball-Top Table. Strippit Fabri-Center FC 1000 II 30 Ton CNC Turret Punch Press s/n 219071185 w/ Strippit HECC-80/3 Controls, 33-Station Turret, Ball-Top Table. Strippit Fabri-Center FC 1000 III 30 Ton CNC Turret Punch Press s/n 200030485 w/ Strippit HECC-80/3 Controls, 33-Station Turret, Ball-Top Table. Wysong mdl. 1010-RD 10’ x 10GA Power Shear s/n PS2-767 w/ Dial Back Gaging, 60” Squaring Arm, Front Supports. Amada CSW-220 8 5/8” x 8 5/8” Hydraulic Corner Notcher / 2” x 4” Coping Notcher Combo s/n 562796. Strippit Fabricator 30/30 30 Ton Fabrication Press s/n198101073. PEMserter Series 4 6 Ton x 18” Hardware Insertion Press s/n J4-2664. PEMserter Series 4 6 Ton x 18” Hardware Insertion Press s/n B4-302. Timesavers Timebelt Sander mdl. 125-1M 24” Belt Grainer s/n 10089. Amada mdl. DB-610 26” Roll Grainer s/n 61000269. Rousselle No. 3F OBI Stamping Press s/n DF-12285. By-George mdl. CS4275 42” Power Circle Shear s/n C27378. Wysong No.236 36” Hand Roll w/ Stand. Pexto No. 137-A 37” Kick Shear. Speed-D-Burr Barrel Style Media Tumbler. 1998 Enco mdl. 100-1527 Vertical Mill s/n 11245 w/ 78-4800 RPM, 16-Speeds, Power Drawbar, Power “Y” Feed, Box Ways. Cincinnati Toolmaster Vertical Mill w/ 140-3800 RPM, 8-Speeds, Power Feed. Tree mdl. 2UVR Vertical Mill w/ 60-3300 RPM, Power Feed. Sheldon Sebastian mdl. B-5 16” x 32” Lathe s/n B22702 w/ 35-910 RPM, Inch Threading 10” 3-Jaw Chuck.